“ Often during my days of house arrest it felt as though I were no longer a part of the real world. There was the house which was my world, there was the world of others who also were not free but who were together in prison as a community, and there was the world of the free. Each was a different planet pursuing its own separate course in an indifferent universe. What the Nobel Peace Prize did was to draw me once again into the world of other human beings outside the isolated area in which I lived, to restore a sense of reality to me. This did not happen instantly, of course, but as the days and months went by and news of reactions to the award came over the airwaves, I began to understand the significance of the Nobel Prize. It had made me real once again; it had drawn me back into the wider human community. 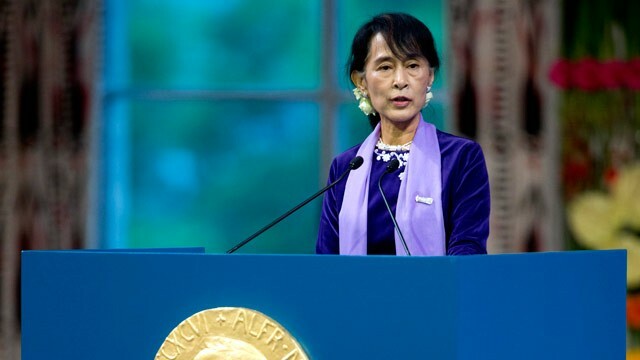 And what was more important, the Nobel Prize had drawn the attention of the world to the struggle for democracy and human rights in Burma. We were not going to be forgotten. ~ Aung San Suu Kyi, Nobel Peace Prize speech in Oslo City Hall, Norway, on Saturday, June 16, 2012 (source: The Washington Post). Sometimes Good prevails over evil, as also demonstrated by the video below. Today was a great day at Oslo City Hall.